Follow these instructions to set up the surveillance video recording type for iDVR-PRO HD security camera / H.264 DVRs from CCTV Camera Pros. iDVR-PRO CCTV DVRs support the following recording modes. Continuous Recording - records around the clock 24 hours per day. Scheduled Recording - records continuously according to a set schedule. Motion Detection Recording - records when motion is detected by a camera. Alarm - records when an external alarm is triggered. Panic Recording - triggered when a user presses the panic button on the DVR. It causes the DVR to record continuously on all cameras. To configure the recording mode that you want to use, hover the mouse cursor over the lower part of the screen. The DVR main menu will appear. Click Menu > Record Setup. 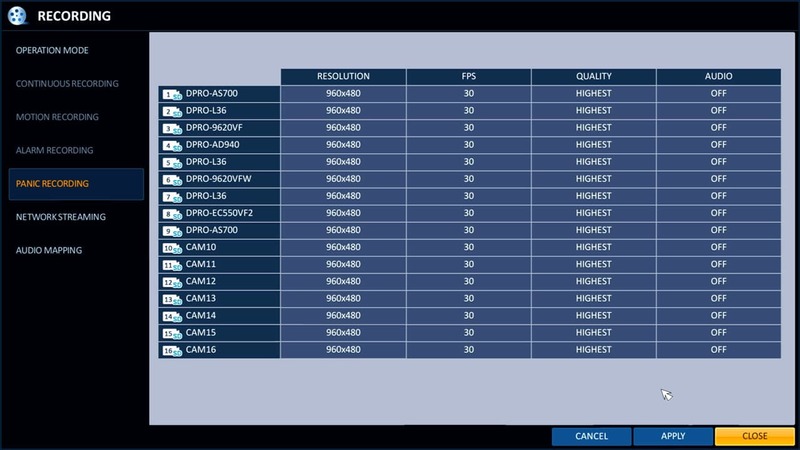 The following screen will be displayed which shows all of the recording modes that the DVR supports. 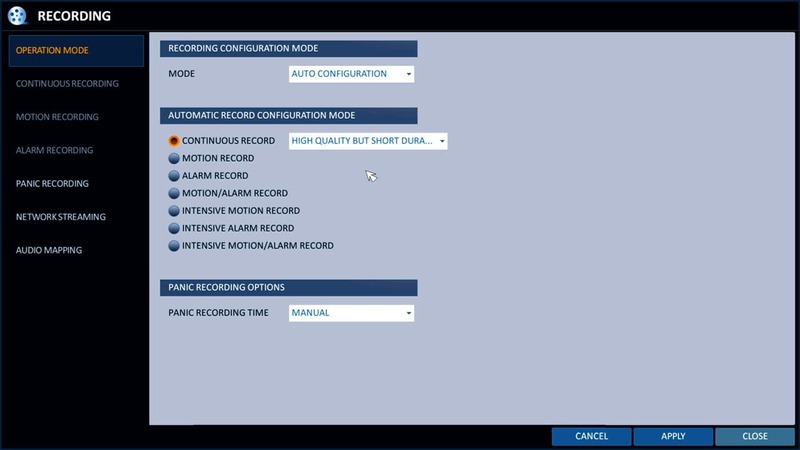 If you want to set up a recording schedule for continuous, motion, or alarm based recording, you must click the drop-down box on the above screen and change the mode from autoconfiguration to manual configuration. Autoconfiguration sets all cameras to record at the max resolution and frame rate for continuous, motion, and alarm type of recording. 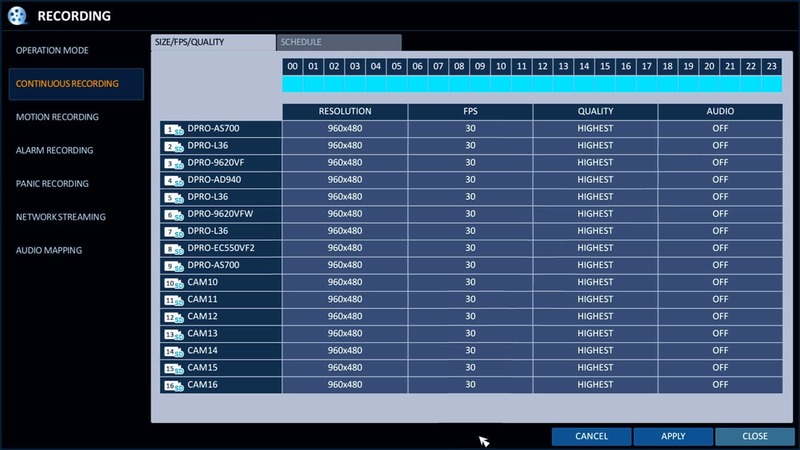 If you select manual configuration, you can set different choose a different frame rate, resolution, and video quality / compression for each camera (even for different time frames). Using the mouse, select the recording type that you want to set up. If you select manual configuration then continuous recording, the following screen is displayed which lets you setup unique configurations for each camera and you can also click on the schedule tab to set a schedule for when each camera will record continuously (effectively making this scheduled recording mode). If you select manual configuration, then motion recording, the following screen is displayed. One this screen users can choose the resolution, frame rate, quality, and whether audio recording is on or off (surveillance microphone required) for each camera when motion is detected. Users may configure each camera for motion detection recording by selecting the motion sensor option under the camera menu. Users can turn motion detection on / off, enable an icon to be displayed on the screen when motion is detected (Mark field), and sensitivity level for each camera. Users can also define specific zones within each camera view for motion detection by selecting the edit area button. 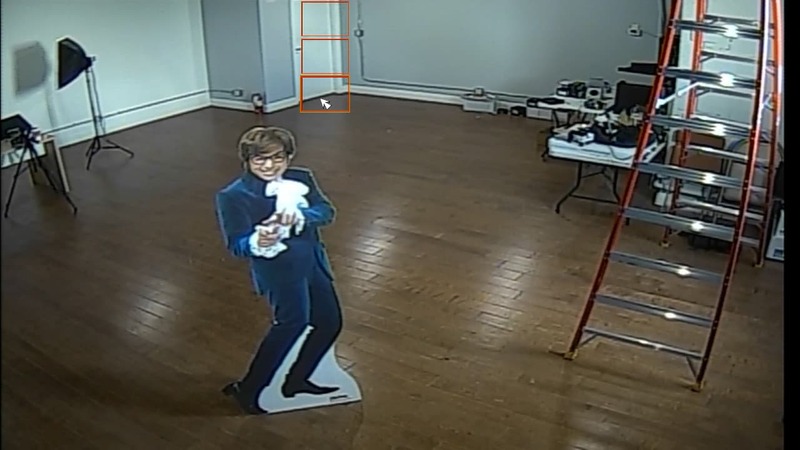 The below screenshot shows how to mark the door in this room as the only area that motion detection will be applied to. If you select manual configuration, then alarm recording, the following screen is displayed. 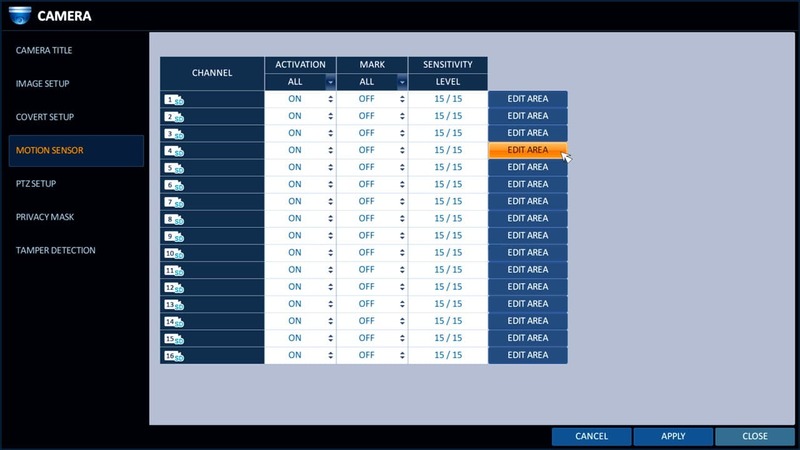 One this screen users can choose the resolution, frame rate, quality, and whether audio recording is on or off (surveillance microphone required) for each camera when an external alarm (such as door sensor, PIR motion sensor, etc) is triggered. 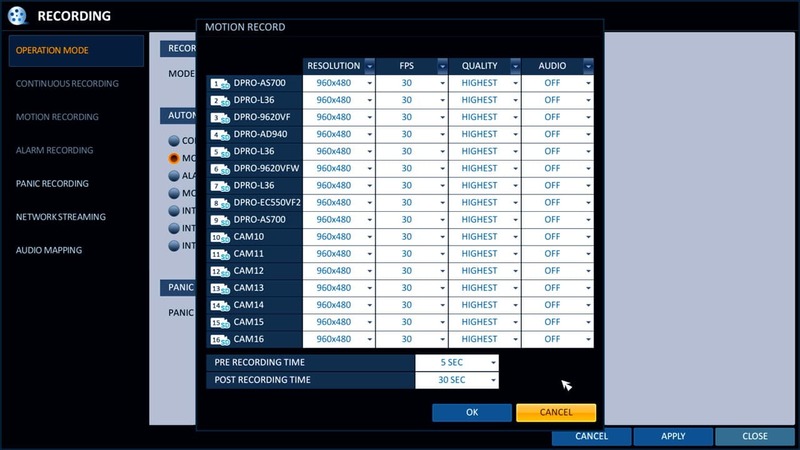 If you select intensive motion recording, then you may configure different recording resolutions, frame rates, and video quality for when each camera is recording continuously and while motion is detected. The idea behind this recording mode is to conserve space when there is no motion (but still record) and record at a higher resolution, higher frame rate, and quality when there is motion detected. This mode is very similar to intensive motion recording. If you select intensive alarm recording, then you may configure different recording resolutions, frame rates, and video quality for when each camera is recording continuously and when an alarm is triggered. The idea behind this recording mode is to conserve space when there is no alarm (by recording at a lower frame rate and resolution) and record at a higher resolution, higher frame rate, and quality when an alarm is triggered. This mode is also very similar to intensive motion recording. 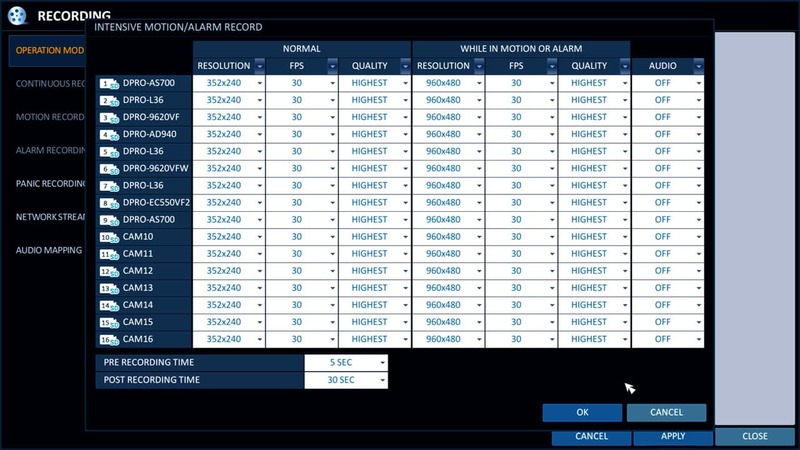 If you select intensive motion / alarm recording, then you may configure different recording resolutions, frame rates, and video quality for when each camera is recording continuously vs. when an alarm is triggered or motion is detected. The idea behind this recording mode is to conserve space when there is no alarm or motion (by recording at a lower frame rate and resolution) and record at a higher resolution, higher frame rate and quality when an alarm is triggered or motion is detected. The panic recording settings control the video resolution, frame rate (FPS), video quality and whether audio surveillance is on or off when panic recording is triggered on the DVR. Panic recording is enabled when a user presses the panic button on the front of the DVR or from the user interface menu using a mouse. When panics recording is enabled, this overrides any current recording mode (schedule, motion, alarm, etc. and sets all cameras to continuous recording).